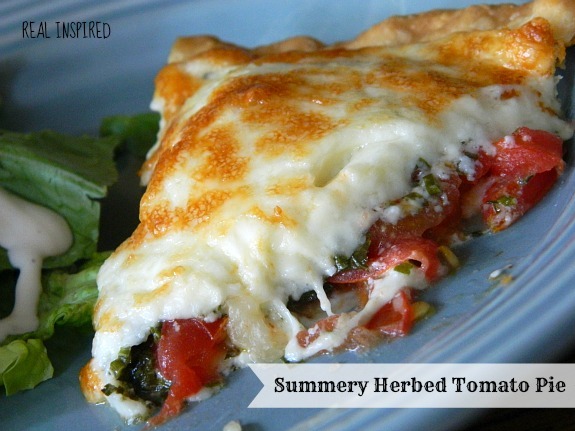 I want to share this recipe for Summery Herbed Tomato Pie with you. It is that good. It sounded pretty nasty to me at first but now I love it! For real, this is good stuff. I originally found this recipe in a Gooseberry Patch recipe book, promptly said "ewww" and moved on. For some strange reason I actually decided to try it one day. Probably because I had 5 tomatoes very close to going bad on my counter. And a pie crust. And it was so good. Hubby was just as surprised as I was and now it's one of his favorite meals. I don't make it regularly, partly because we PIG OUT on it! Press pie crust into a 9" pie plate. Bake at 425 degrees for 5 minutes. Reduce oven to 400 degrees. 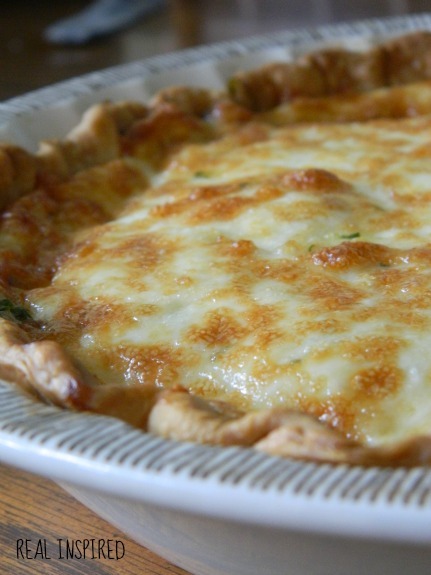 Arrange tomato slices in crust; sprinkle with chives, basil, salt, and pepper. Combine cheese and mayonnaise; spread over tomatoes. Bake at 400 degrees for 35 minutes. I promise this is delicious! And super easy to put together quickly! It goes great with a side salad. And I'm not sure who came up with the 8-10 servings because we can almost polish it off in one sitting, gluttons that we are. I can't wait until I can make it with tomatoes from our own little garden, which I haven't killed yet, in case you were wondering. This sounds amazing! Just wish my Mr. ate tomatoes! :( Ps. I have tried to kill my tomato plants 3x now, and they are still kicking! They got blight in Early May, (ps, if you're get blight, let me know, I have a non chemical solution for you!!!) then we moved and tried to move my containers on the back of a trailer, and they got wind burnt, then they got bugs so someone told me to spray diluted dawn detergent on them to kill the bugs and stay organic, bad idea, don't do it! They've seen better days, but they are still kicking!!!! Haha mine doesn't care for tomatoes either, but he LOVES this. You should make it anyway, even if it's just for you! It's so good! Too funny about the tomatoes! I was under the impression that they were quite the delicate plant. Glad you still have them! Holy moley does that look delicious! I just bought tomatoes because I'm in the mood but had no idea what I was going to do with them. It's like an encrusted, cheese filled ratatouille! Make it! It's so good! 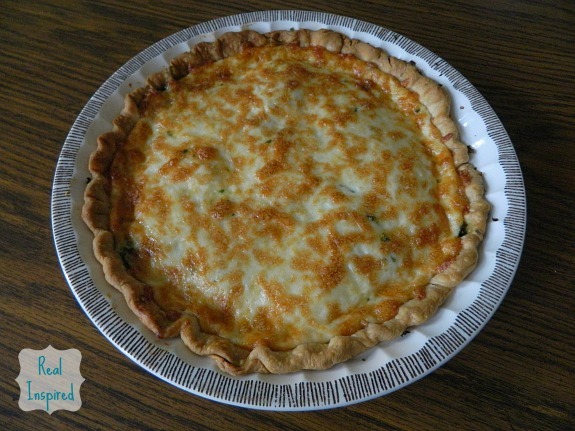 Mmmmm, I love tomato pie! I usually use cheddar, so I'll have to try this with mozzarella. I'm visiting from Rain on a Tin Roof link party. I might have to try cheddar now. Sounds good! Thanks for visiting! Thanks for the link up reminder! I did it last time and forgot this time. Thanks for the party! Oh man, I can't wait until my tomatoes start coming in in my garden now! This looks AMAZING. I wonder if you could substitute greek yogurt for the mayo to make it a little lighter? Hi Heidi! I usually use light mayo to lighten it up but greek yogurt might work well too. You could try it and see and let me know how it goes! 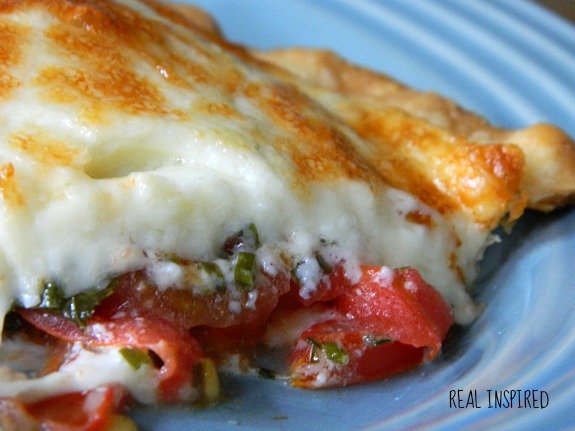 This is the perfect recipe for tomato season! Thanks for visiting & sharing at the party Theresa @ DearCreatives.com Hope to see you again soon. Forgot to tell you I am featuring you this Friday! Be sure to drop by & grab your featured button! WOW! Cheesy goodness! Thank you so much for linking up! Hope to see more from you. Thanks so much for sharing this at my Happy Monday Show & Share @ HappyWifey.net! I featured this because it looks GREAT!